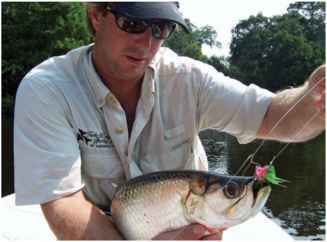 Most trout anglers love this method of casting, which is performed on a horizontal position. With your body twisted, you would flick your wrist while simultaneously moving the rod in a horizontal method to the left or right of your body. The nice thing about the side cast is that it works well in a number of situations. For instance, if you are fishing water where low hanging branches are a problem, this works well. This type of cast is also excellent if you want to avoid getting your spinner snagged. By using the side cast, you are virtually undetected by the trout in that there is little to no rod flash and no problem with a silhouette from your body or the rod since you are not raising the rod over your head with this method. Using the horizontal position, you have the advantage of being able to stay low to the water line and closer to the 10 degree to the horizon, which as you know is the blind spot for the trout.